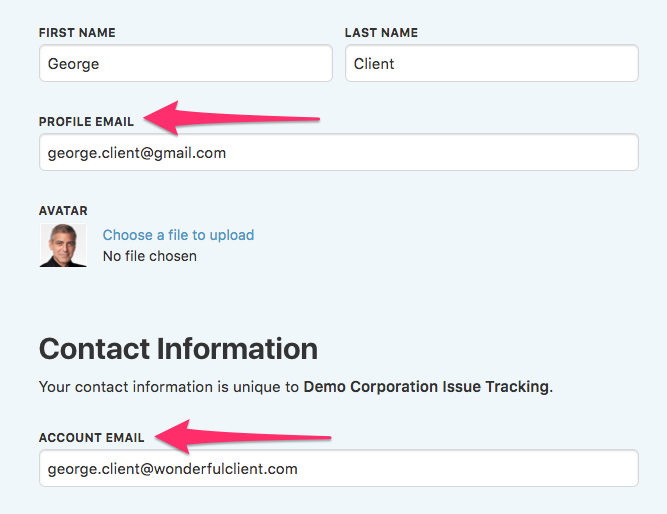 In DoneDone, we track two different types of email addresses: a profile email address and an account email address. This might seem confusing at first, but this article will clarify things. Your profile email address is where we send your initial registration email to. It's also what you'll enter when you've forgotten your username or password. Think of the profile email address as your unique email identifier. We recommend this be a personal address—something that won't change if you leave a company. Your account email address is specific to each DoneDone account you belong to. It's where we send all emails related to issue updates. For example, you are part of two accounts, your work account (e.g. work.mydonedone.com) and an account you use for your own moonlighting business (e.g. freelance.mydonedone.com). You may want all notifications from your work account to go to your work address and all notifications from your freelance account go to your personal address. Can the profile and account email address be the same? Absolutely. In fact, whenever you're added to a new account for the very first time, we default your account email address to your profile email address. Similarly, you could use the same account email address in multiple accounts. In the example above, you could have both account email addresses set to your personal email address if that's where you'd prefer to receive all communication. You can update either email address by signing in to one of your accounts and updating your profile.